Please note the design may vary, you may receive a coin that is not shown on images. 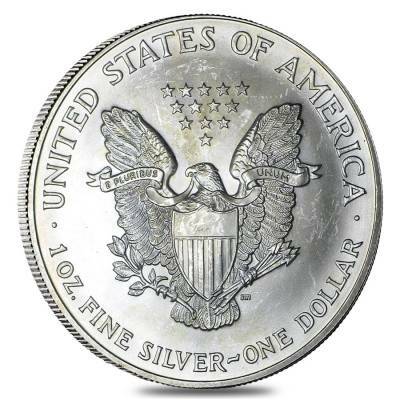 The American Eagle Silver Coins were first struck in 1986, and they are struck in only 1 troy ounce size. Watch the Walking Liberty design come alive in beautiful colors which highlights the coin. The colorization of the design is done using high quality technique which gives it a wonderful lively look. They will stand out among your collection of coins with their amazing colors. Each individual coin comes in encapsulated. 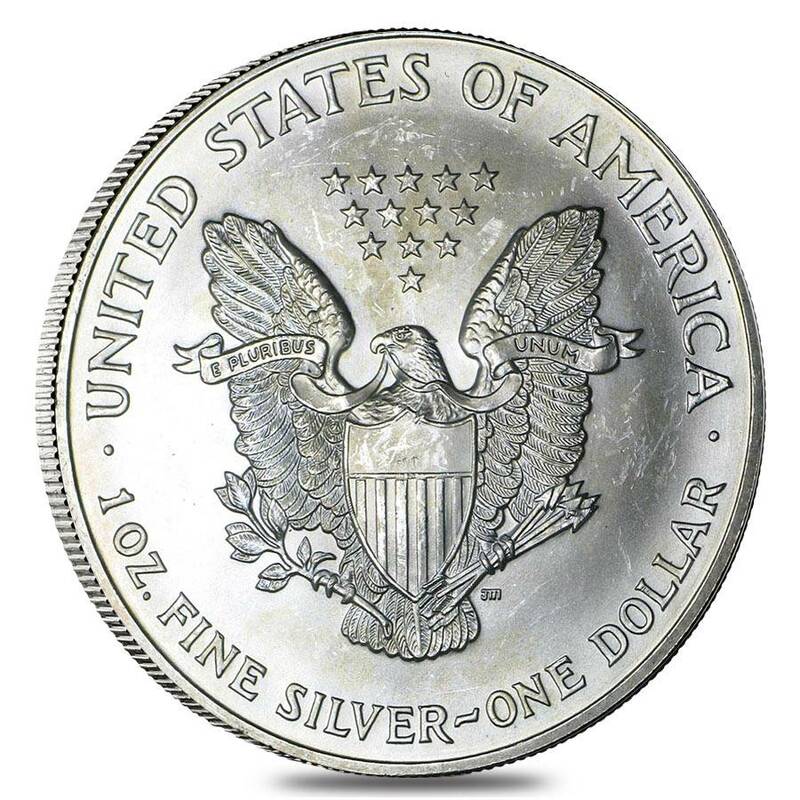 The intensity and style of coloring may vary from coin to coin giving the coin a unique look. Obverse: Features a full length image of Lady Liberty walking with outstretched hands towards the rising sun with her gown and the draped flag billowing around her. She is holding olive and oak branches in one hand to symbolize peace and strength. Inscriptions - “IN GOD WE TRUST,” “LIBERTY,” and Year of Mintage. A design by Adolph A. Weinman. Reverse: Depicts a heraldic eagle behind a shield clutching an olive branch in its right talons and a bunch of arrows in its left talons. 13 small stars above the eagle, representing the original colonies. A design by John Mercanti. Minted from 1986-Present. Dates will be chosen randomly based on availability within the mentioned period. 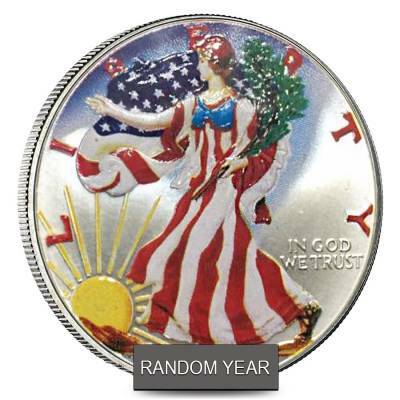 Mint issues chosen randomly based on availability could be from Philadelphia Mint, San Francisco Mint, and West Point Mint. 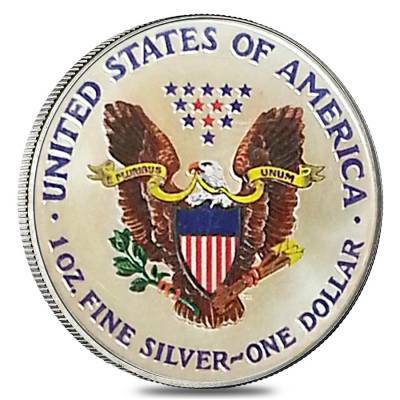 A legal tender issues guaranteed by the US Government and U.S. Mint. 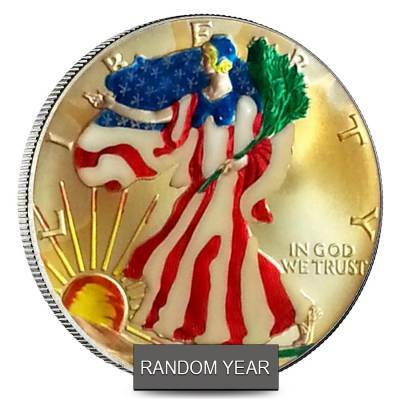 Why Buy Colorized Silver American Eagle Coin? 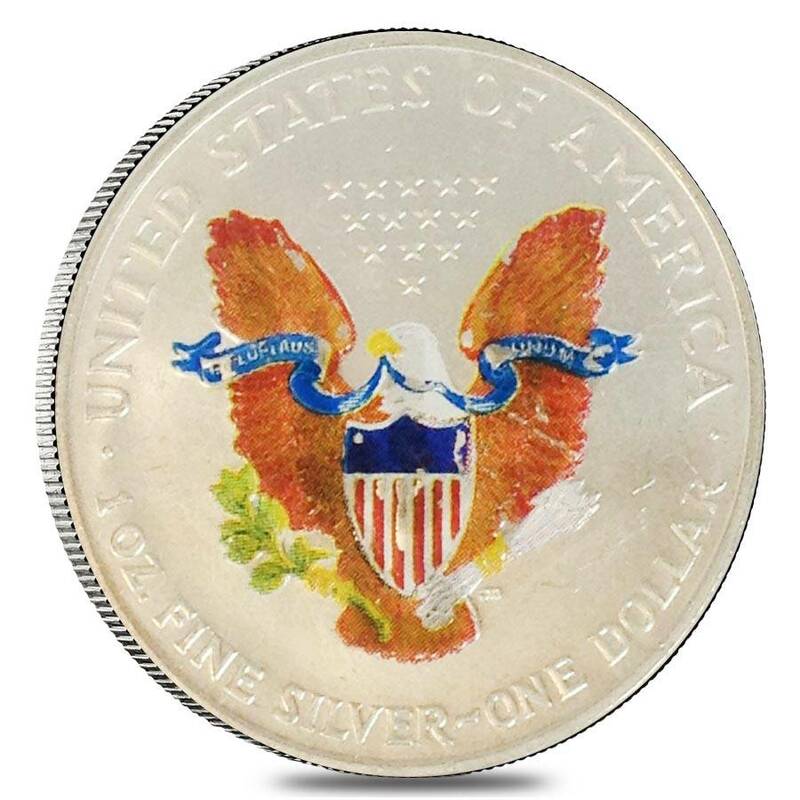 American Silver Eagle are the most common bullion coins to come in the colorized form. It will add some uniqueness to your collection. 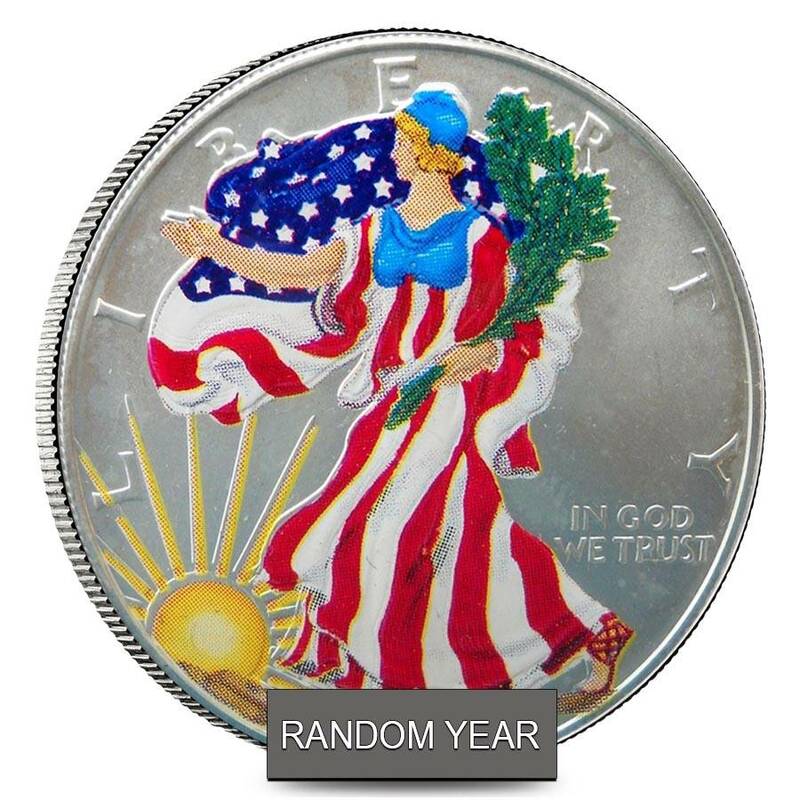 These US Silver coins can be novelty gift items. Contain .999 pure silver beneath all the colors. The coin is eligible for IRA. Guaranteed by the US Mint for weight, content, and purity. Legal tender bullion coin of USA. The beckoning image of Walking Liberty on the Silver American Eagles is glamorized all the more by adding colors to the design. The Walking Liberty looks enthralling in her colorized version. At last we can now see how Walking Liberty looks in her colorful avatar. 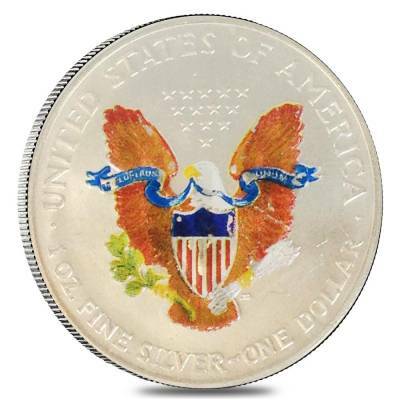 The American Silver Eagles were first released in 1986 after the Liberty Coin Act was approved in July 9, 1985. 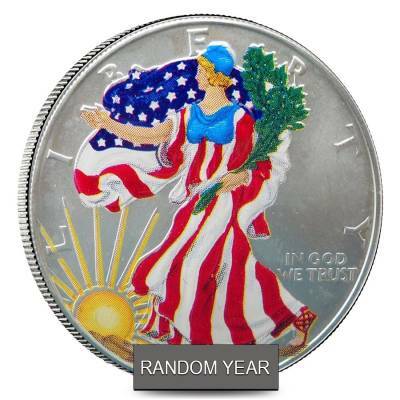 The coin is backed by the U.S. Mint for its weight, content, and purity. The coins have been minted at three different locations; Philadelphia Mint, San Francisco Mint, and the West Point Mint. The coin has a face value of $1 and is eligible for Individual Retirement Accounts. The colorized coins serve as a unique and novelty gift item especially to kids, to boost their interest in coin collection. The advantage of colorized coins is that it enhances the design of the coin, it brings out the full beauty of the coin by defining the design giving it a more realistic appearance. A high standard technique is used to color these coins which gives a captivating look to the intricate design. The colorized coins add interest to your collection of coins. The colorized coins are only available in limited quantity as coloring is a tedious process. This process is out of the hands of the US Mint and done by private facilities. This procedure can vary from one facility to the other hence the variation in the intensity and style of coloring of each coin. Bullion Exchanges is pleased to offer the 1 oz Silver American Eagle $1 Colorized Coin (Random Year) ​at one of the most competitive prices in the industry. 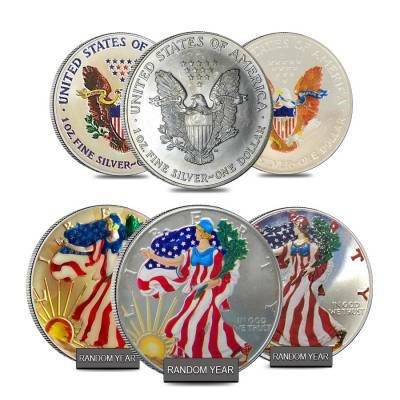 Browse our collection of Silver American Eagle Coin Series now. Feel free to contact us at 800-852-6884 if you have any questions in regards to any of our products. can i get a gold one? With this purchase, you earn 22 Bullionaire Bucks 22 BB = $0.02. For every $1 spend, you will earn 1 Bullionaire Buck which is equivalent to $0.001 off a future purchase. 22 BB = $0.02.